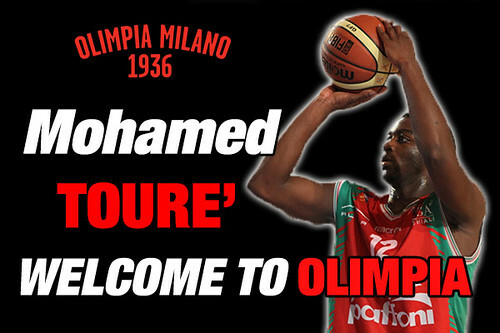 Pallacanestro Olimpia EA7 – Emporio Armani Milano agreed on terms with Mohamed Tourè, a point-guard, 1.90 mt. tall, 21 years old, coming from Omegna. COACH BANCHI’S OPINION – “Tourè’s signing is allowing ourselves the opportunity to give exposure to one of the best prospect from the excellent Lombardia’s youth system. After some positive seasons in the minors, Mohamed will have the great opportunity to measure himself to an higher level of competition. From our point of viev we hope he can contribute efficiently to the need of our team”. THIS IS WHAT TOURE’ HAD TO SAY – “Milano’s calling surprised me a lot and made me extra, extra happy. Now I have the opportunity to practice for one full year with the best players, people very experienced from whom I can really learn a lot. To me this is a great challenge: my personal goal is to “steal” some minutes per game. To do that, there’s no other way than put the head down and work, work and work harder”. WHO’S TOURE’ – Born in Angera, on April 27th, 1992, Mohamed Tourè began to play in the minibasket classes of his hometown until he was recruited by Robur et Fides Varese where he spent all his youth years right to make the debut with the first team. In 2011 he won the Italy Cup of the minors with Varese and was named Mvp. In the summer of 2011 he moved up one notch to play for Omegna, playing 34 games, averaging 4.8 points per game, 0.8 assists, 1.6 rebounds. During the last season, he improved to 7.1 points per game, 2.1 rebounds, 1.3 assists, while shooting with 43.0% from three and 80.0% from the line. NOTES – Tourè has been part of the Italian Under 18 National Team at the Eruopean Championship of 2010. and a member of the Under 20 Team at the European Championship in 2012.